Is the Industrial Revolution a Good Thing? The Industrial revolution is happening right here, right now. You've probably become a victim of it by now. Over population has become a huge problem. In sixty years the population in rural areas have doubled. There have been food shortages since there is less farm land and less farmers. There has been an unbeliveable increase in the amount of jobs for men and women to work in factories and coal mines. Factories and coal mines are now allowiing child labor as young as six years old both boys and girls are welcome to work. Imjuries have also increased and life expectancy is now lower than 40 due to all the pollution and unsafe working areas. New diseases have been named, like cancer, and is uncurable. There is more healthcare to deal with all the injuries, and new buildings called hospitals to go and get help for those ilnesses and injuries. 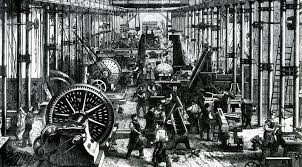 To increase the production of goods there have been more inventions, like the steam powered engine and burning coal gas for energy and stem powered trains and so much more. Land has become cheaper and more attainable. And after a long day of work you can go to the pub and relax, have a drink. There are now buildings called schools for the children to learn on their days off. Some people don't agree with the use of children as workers or "slaves". There are accounts of children who are not fast enough or are to rebelious getting whipped. Their lunches only last about 30 minutes out of their 12 hour work shifts. 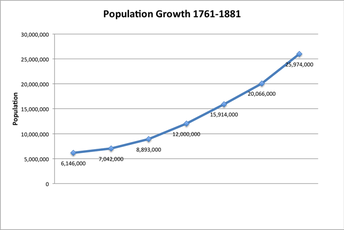 This graph is a prediction of the growth of the population from 1761-1881. The population is to quadruple in size over the next 100 years. A photo of what the factories currently look like, this is one taken in a cotton factoriy. Both men and women were allowd to work, men getting the most payment compared to women and children combined.